A personal autobiography remains one of my favourite genres of writing, because it allows the reader into a seemingly private world of memories, both positive and negative – heartwarming and sad. One potential danger with this genre is that the writing becomes too personal, or that the wealth of memories become so scattered that it sends the reader bouncing around like a pinball, as we try endlessly to make sense of what is being relayed. Therefore, the emphasis is strongly upon the writing to be easily understandable and exciting enough to carry us the length of the reading journey. In Michael J. Kelly’s memoirs of his early life, Just A Boy From Bristol, thankfully we have a master storyteller, who produces top quality prose with effortless ease. Michael’s story begins in 1939. War has just been declared and his father is away fighting in the Royal Navy, leaving his mother to bring up Michael and his baby sister, Mary. 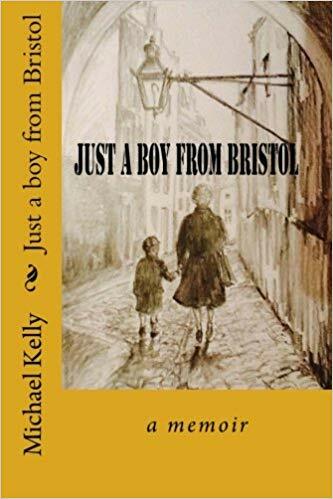 The book follows the plight of the Kelly family as they move around Bristol, dodging air raids and looking to settle down, to wait for the war to end and for Michael’s father to return to the house. Each chapter of the book takes us into new challenges for the young family in such dangerous times and, as readers, we are carried along with Michael’s skilful writing and allowed to explore everyday life around 1940, in a Britain rapidly becoming devastated by rationing and bombing. We get to see the good side of life during wartime; the kindness of strangers, counterbalanced with the social judgement of some towards others. Michael’s growing passion for sport and the games of football that led him into new friendships. The simple thrills of being able to go to the cinema. We read of the devastating impact on schoolchildren and schools, especially when the names of some children would be forever missing from the register. We get to see the impact that the American G.I. soldiers had upon Bristol and how they brought dangerous excitement into a grey, fearful world. Michael’s writing style is superb – simplistic and no-nonsense, he merely states it as it was. Indeed, a major effect of the book is that it is written entirely through the eyes of an innocent child; a young boy who dotes on his mother and wants only the best for her. Personally, I was fascinated by this book, as it covers a lot of ground that I knew from my own childhood in Bristol, including some of the very same people that I grew up with. However, this is a book for everyone with a passion for social history and a curiosity about life in 1940’s Britain. I hear a follow up book is on the way from the 82 years young, Michael Kelly. It will be a genuine pleasure to read it, as it was to glide through the pages of this astonishing book.